MariaDB 10 is the version which MariaDB deviated from MySQL 5.6 to indicate that not all features of MySQL 5.6 is implemented in MariaDB 10, while MariaDB includes even more features that are not available on MySQL, such as ExtraDB, Aria, Cassandra, CONNECT storage engine. MariaDB 10 also important in such a way that it includes several much wanted features, including full-text indexes search support. If you haven’t upgraded to MariaDB 5.5, visit the tutorial Part 1 – Install and Upgrade MySQL to MariaDB 5.5. Note: Since MariaDB is drop-in replacement for MySQL for version <= 5.5, if you're on MySQL 5.5, you can follow the steps outlined below to upgrade to MariaDB 10 directly, without having to switch to MariaDB 5.5 beforehand. If you continue to upgrade process from MySQL 5.1 to MariaDB 5.5 to MariaDB 10.0, skip this step. Else, backup your databases. For MariaDB, the command actually removes MariaDB-server and MariaDB-client. Your system may have “MariaDB-common” and “MariaDB-compat” or “mysql-libs” and “mysql-devel” packages installed. If they’re not been removed as part of dependencies, use yum remove MariaDB-common MariaDB-compat or yum remove mysql-libs mysql-devel to uninstall them too (mysql-libs is also drop-in replacement for MariaDB-compat). 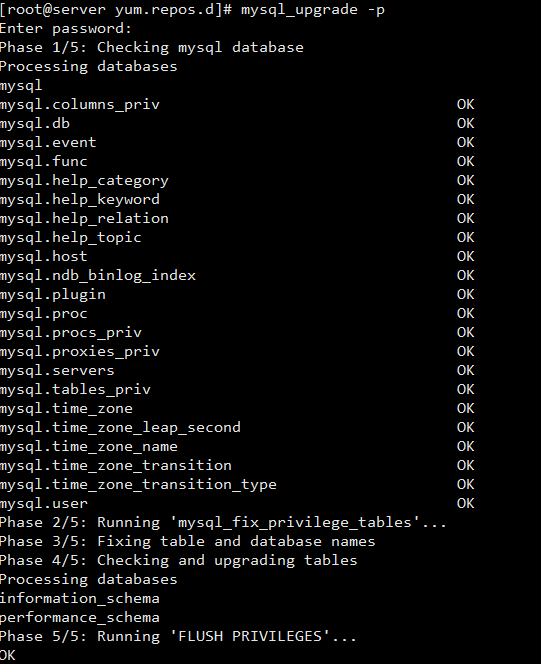 Sometimes yum will include a lot of still needed dependencies to be removed with MySQL. In this case, use the rpm -e –nodeps package_name to remove just the individual package without affecting any dependencies. For example, rpm -e –nodeps MariaDB-server. 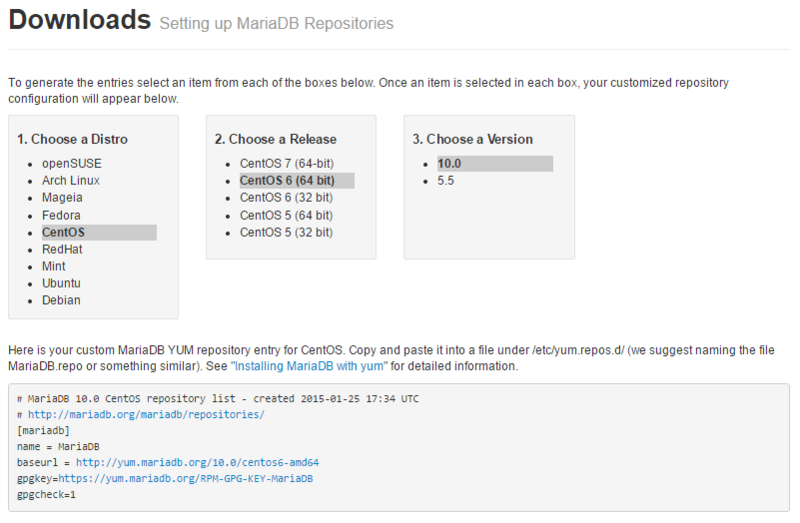 Visit MariaDB repository configuration generator to setup a MariaDB 10 repo by selecting your distro and release. Edit the file named MariaDB.repo (or any name that you chose) in /etc/yum.repos.d directory, and replace the content inside it with the custom MariaDB YUM repository entry for CentOS generated. The installation and upgrading to MariaDB 10.0 has completed. By default, MariaDB no longer uses /etc/my.cnf as the single configuration file for the rDBMS. Instead, the configuration file has been split into several files located inside "/etc/my.cnf.d" directory, namely mysql-clients.cnf, server.cnf and tokudb.cnf. To complete the migration to MariaDB 10.0, relocate the MySQL configuration settings from the backed up my.cnf to appropriate section in appropriate new .cnf file for MariaDB 10. Also take note of variables which have changed between versions. If you does not like the new MariaDB .cnf structure, you can continue to use a single my.cnf file, replacing the MariaDB 10 default version.